Stats: Big Boots '19 - Bone Up Brewing Co. Brewers' Notes: Every year, the Pink Boots Society - an organization that's geared towards supporting women in the beer industry, with a strong focus on fostering a sense of community - organizes a big ol' collaboration brew fueled by ladies from all over the world! 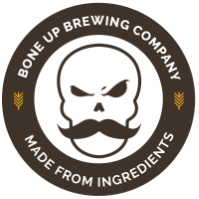 This year, the women of Bone Up brewed up a lil' thing perfectly suited for springtime. Brewed with fistfuls of our favorite fermentables (namely oats and local wheat) and hopped with new-to-us Idaho Gem, Big Boots '19 has lovely notes of white peach and mango with a hint of tang from the wheat. Come try some and raise a glass to the lovely ladies who brew the best beverage around!